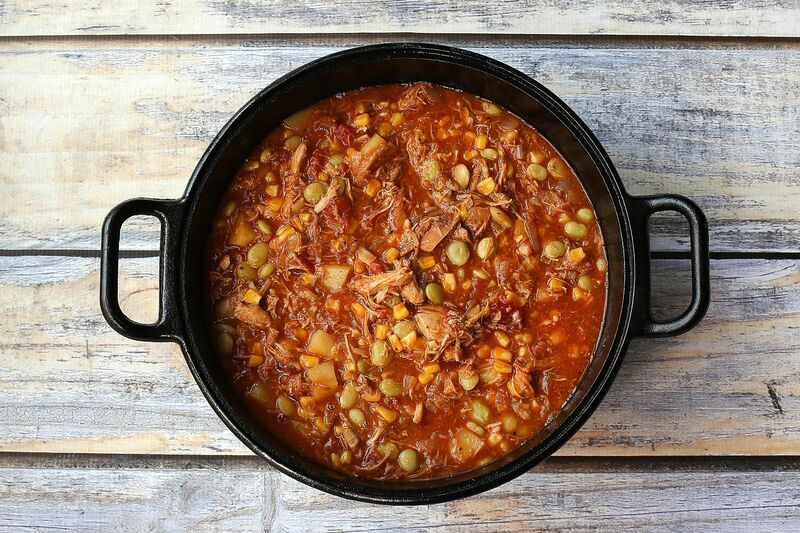 Brunswick stew is a traditional favorite with its roots firmly planted in the South. It's a versatile stew that you'll often find—in some regions or the South—served with barbecue or at special community events. As for the origins, there are a few claims on its creation. According to one story, Brunswick stew originated in Brunswick County, Virginia. Purportedly, in 1828, Dr. Creed Haskins of the Virginia state legislature asked for a special squirrel stew from "Uncle Jimmy" Matthews to feed people attending a political rally. Georgia residents claim their Brunswick, Georgia version is the original. It's just as likely the stew—or at least a very similar version—was created much earlier. With the original ingredients of game (usually squirrel) and corn, and long-simmering over an open fire, it's typical of early native American dishes. There's no shortage of opinions on what should and should not go into an "authentic" Brunswick stew, but no matter what you put into it for vegetables and meat, the results are pure comfort food. These days, Brunswick stew is most commonly made with chicken or a combination of several types of meat, which might include rabbit, beef, and pork. Onions, corn, and tomatoes or barbecue sauce are frequently included, and many recipes call for lima beans, peas, and okra. Whether you like yours with chicken, squirrel, rabbit, or pork, you'll find a few recipes to choose from in this list. This flavorful Brunswick stew is a symphony of flavors and ingredients. Chicken thighs and pork are the main proteins, while a wide variety of vegetables and seasonings add flavor and color. Go ahead and use leftover pulled pork and a shredded rotisserie chicken if you're short on time. The stew will still taste as if you had spent the whole day cooking. This version is a classic Virginia-style Brunswick stew made with chicken. potatoes, lima beans, corn, and tomato sauce add to the color and flavor. Don't feel as though you have to follow the recipe exactly. Add some leftover pork or bacon to the stew or change the vegetables up to suit your family's tastes. The stew is excellent with freshly baked cornbread. Or serve it with a fresh and crusty French bread. Barbecue sauce and hot sauce add to the flavor in this version of the stew. The ingredients in this Brunswick stew include chicken, potatoes, and cream-style corn, along with the barbecue sauce and ketchup. This recipe doesn't call for lima beans, but feel free to add them along with the vegetables. Another tasty Southern stew is the pictured Frogmore stew—also known as Beaufort stew—which is essentially a shrimp boil. You'll find similar seafood boils in many coastal areas of the South. In Louisiana, you'll find delicious Cajun and Creole-style gumbos and seafood dishes, like this shrimp Creole. Many of these dishes are served over a mound of hot cooked rice. Red beans and rice is another regional stew-like dish that's budget-friendly and easy to fix and cook on the stovetop or in the crockpot. Kentucky's famous burgoo is a stew similar to a Brunswick stew. It's made with a variety of meats and vegetables and is a favorite dish to serve at barbecues and festivals. It originally contained game meats, like squirrel, raccoon, or game birds, but has evolved to include pork, chicken, beef, or mutton, or a combination of several types of meat. Country captain chicken stew is a somewhat unusual Southern stew. With its curry-style ingredients, you might be surprised that it originated in Georgia. Purportedly, a British army officer brought the recipe—with its exotic spices—from India. Chicken and dumplings is another much-loved dish made with a stewed chicken. Homemade dumpling dough is either rolled and sliced or pinched off into pieces and dropped into the boiling broth. Other regions use soft biscuit-like drop dumplings. If you travel to the Southwestern states, you'll find many chile based offerings, including beef and pork chilis and chicken chili with beans.